Where else can I go to spend $6.99 on 16 ounces of juice? 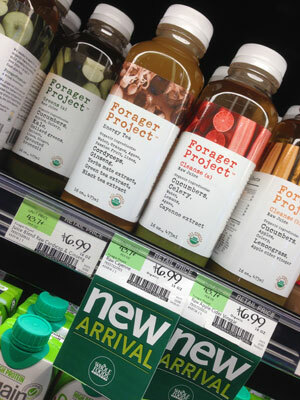 I didn’t buy any Forager Project juices, but the very fact that they are available at Whole Foods makes me happy. I’m sure there are some amazing health benefits, but I am not willing to spend that amount to discover them. If you are willing to offer something that no one will buy, it could benefit you – if only to show your customers that you think outside of the box. So go to Whole Foods today to discover a new amazing product that you won’t buy. Chances are, you will buy something else. I did. I had a friend who called it Whole Budget Market because their prices are so high. For products they sell which are also available elsewhere (ex., Amy’s Foods frozen items), the WF prices are consistently 20 to 30 percent higher. I think they jack up the prices ’cause they know many of their customers are looking for WF niche products they can’t find anywhere else. It’s unfortunate for people whose closest market is Whole Foods, though. Love that – “Whole Budget.” Most people cannot afford for Whole Foods to be their primary grocery store. What I don’t understand is how Trader Joe’s can sell organic produce for not much more than grocery store produce prices (and often less) but Whole Foods has to charge so much more. Unfortunately Trader Joe hasn’t made it to Tampa or Dallas. Tim, agreed – Trader Joe’s is the winner. (But they don’t have nearly the big selection of weird products like Whole Foods has. They are coming to Boulder – an hour from Denver. That will make for a good family field trip for us. About 10-12 years ago, the Whole Foods market in Glendale, where my parents lived, moved from a smaller store to a larger one down the street. I happened to be visiting my folks on opening day, so I drove by the new store. There wasn’t a parking spot for blocks around! I bet the neighbors were furious! It’s a good thing there’s not a Whole Foods closer to me than a 40-minute drive, I spend way too much when I go there. But I never buy the regular stuff I could buy at the local supermarket, they are too expensive for that. I love the cheeses, the olive bar, the lunch buffet, and they do have a bigger meat and seafood selection than most of the markets near me.